One of my anti-resolutions, listed below, is not to obsess about my weight, but neither will I neglect my health. Part of not neglecting my health is to change my diet. I'm so bad about grazing, the act of wandering through the kitchen and eating whatever I happen to find. I need to have food on hand that is reasonably easy to prepare and is good for me. When I'm tired from work or my RA is acting up, the last thing I want to do is cook and it shows in the lack of a decent diet. To help my RA meds do a good job of keeping me healthy, I have to eat better. Yeah, there needs to be exercise in there too, but let's start with one thing at a time. I like to try new recipes. I wouldn't be a subscriber to Cooking Light if I didn't see the possibilities in some of the recipes they publish. I have manilla envelopes filled with recipes. Years ago, my mother sent me a box of recipes she'd been given and had collected from various aunts and cousins and herself over decades. And, while poking around in my Flickr account, looking for a photo for something else, I was reminded of all the times I tried something and posted photos of the results, both good and bad. It's time for an anti-resolution. I'm not going to try to cook something new every day, but I'm not going to neglect these decades of collected recipes. I had high hopes at Christmas and purchased a number of items to have a unique food experience over that day. But I didn't feel well and Christmas is a blur of naps and cereal and cinnamon toast. Having more energy on New Year's Day, I decided to look over the recipes I'd pulled to try at Christmas and make something. I forgot to buy chicken bouillon cubes so that recipe will have to wait, but here are two I made for my New Year's Day lunch. NPR has, I think all year last year, trumpeted the "meatless" Monday. The raising of meat sources; poultry, beef and pork; puts an environmental strain on the planet. The idea is that going meatless, eating lower on the food chain, as it were, is less stressful and more sustainable. There is some debate about that claim, particularly as it involves pesticides and GMO grains. For me, I'm not sure I can remember to go "meatless" once a week. It's a noble goal, but I'm not going to commit grandly and with much fanfare to a "meatless" Monday, let alone once a week. I'm going to try to fit in meatless and see how it goes. New Year's Day accidentally turned out meatless, with cereal for breakfast and this meal, which really came at 2:30. The evening's World of Warcraft playing was accompanied by popcorn. 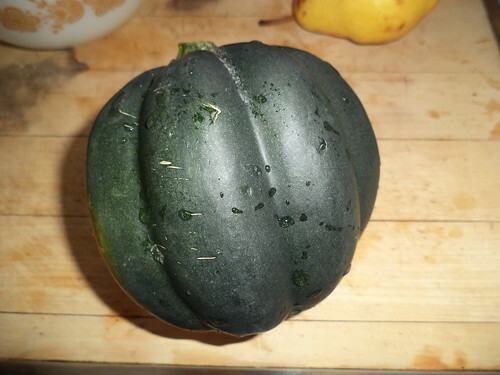 I started with an acorn squash. I have no idea where I got the recipes from. They were in my "Salads" manilla envelope. I love these. My dad used to grow them in the family garden. He would slice it in half, scoop out the seeds and fill the cavity with butter and honey, then bake the squash for 45 minutes. Oh, was it good. I've stumbled on a recipe I think I prefer. 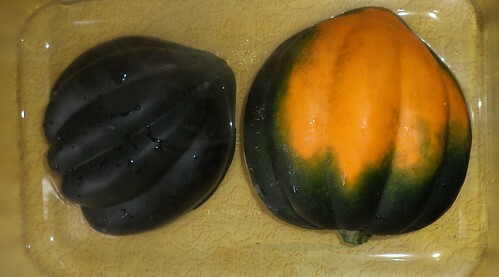 You still need to slice the squash in half and scoop out the seeds, but you put it face down in a baking dish and fill the dish with a half inch of hot water. This is baked, uncovered for half an hour at 350. 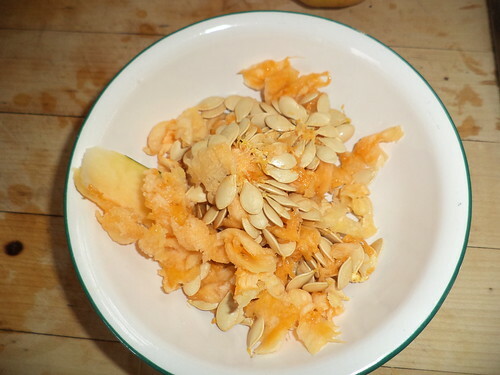 I set the seeds and pulp aside. I'm going to let these dry out and put them on a paper plate on the deck for the squirrels. Once the squash was in the oven, I made another salad. This one is ridiculously easy. Take a half cup of vanilla yogurt and mix 1/4 tsp ground cinnamon into it. I just used a container of Yoplait regular vanilla yogurt. It's the version in the red trimmed container. It's 6 ounces, which is more than half a cup but it worked, I think. 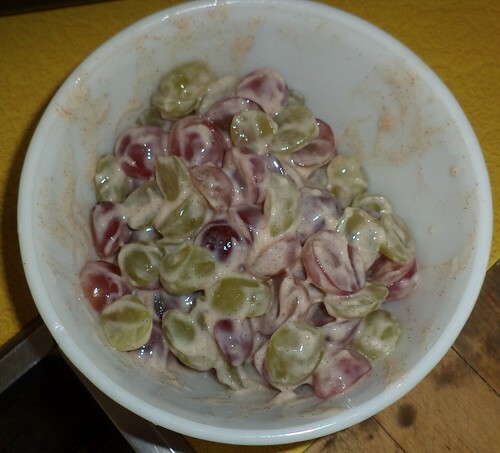 Into this mixture drop 2 cups of red and green grapes, halved. Stir thoroughly to get the yogurt to cover all the grapes, cover the bowl and put in the fridge while you finish up the squash. 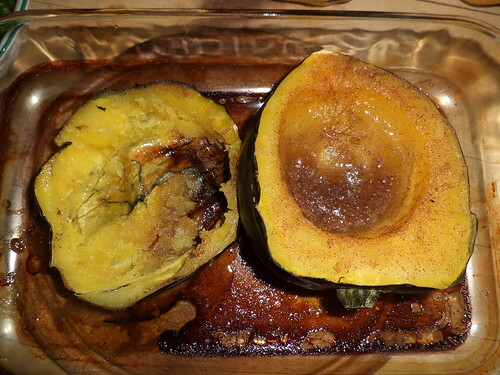 When the squash has cooked for a half hour, remove from the oven and pour out the water. There won't be a lot left. Flip the squash over and fill the cavity with a mix of three tablespoons melted butter mixed with one tablespoon brown sugar and 1/8 teaspoon cinnamon. Divide this evenly through both halves of the squash. Put these back in the oven and bake for another 15 minutes. 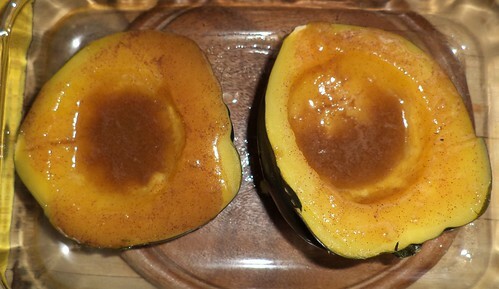 The squash is already soft so you're infusing the pulp with the butter, brown sugar, cinnamon mix. The recipe said to baste the pulp often, but I didn't think it needed it. 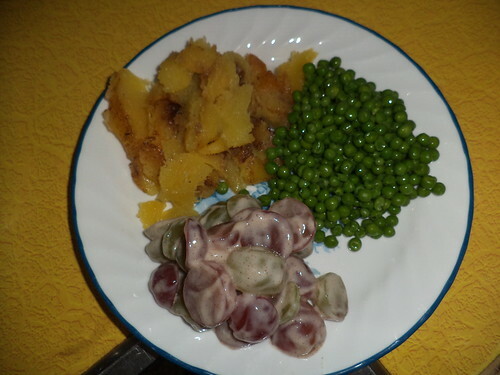 The other thing the recipe had me do was cook a small package of frozen peas during the time the squash was cooking. When the squash came out of the oven, 1/3 cup of cooked peas are added to the center well and the squash is served. What I discovered is that the squash halves are very soft at this point. I decided to scoop the pulp from the half and serve it next to the peas. The pulp comes out of the shell very nicely. Here was my mid-afternoon lunch. I'll eat peas with most anything. The salad had chilled nicely and the yogurt, cinnamon mixture complemented the cinnamon in the squash. The peas were Green Giant steam in the bag brand. As a rule, I don't really care for them. I prefer the Green Giant buttered peas in the bag, but I think this version went well with the butter in the squash. I actually noshed a bit on the salad later in the evening. These two recipes are keepers. The squash recipe was designed for a crowd so I had to do math (yikes) to figure out the amounts for one squash. The best part of all of this is that I have leftovers for lunch or dinner.